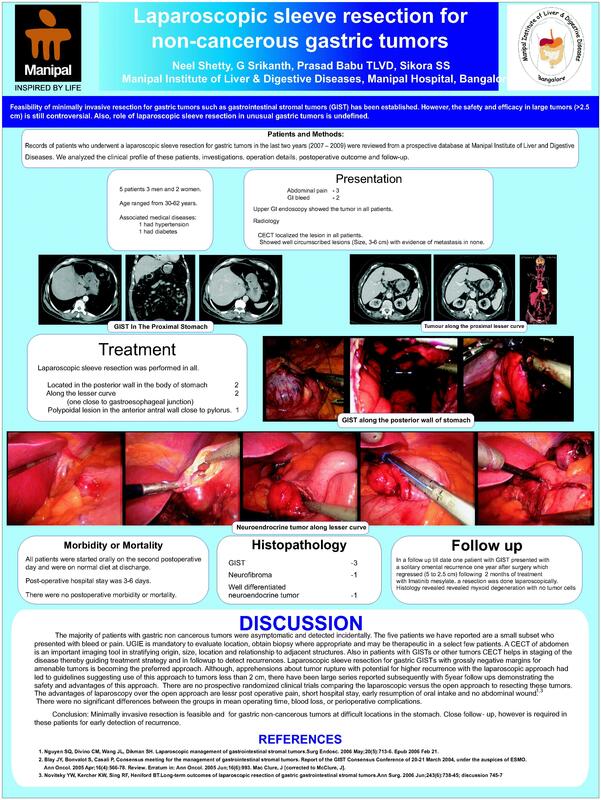 Introduction: Feasibility of minimally invasive resection for gastric tumors such as gastrointestinal stromal tumors (GIST) has been established. However, the safety and efficacy in large tumors (>2.5 cm) is still controversial. Also, role of laparoscopic sleeve resection in unusual gastric tumors is undefined. Methods: Records of patients who underwent a laparoscopic sleeve resection for gastric tumors In the last two years were reviewed from a prospective database at Manipal Institute of Liver and Digestive Diseases. We analysed the clinical profile of these patients, investigations, operation details, postoperative outcome and follow-up. Results: Five patients with age ranging between 30 to 62 years underwent laparoscopic sleeve resection for non-carcinomatous gastric tumors. There were three male and two female patients. Two presented with gastrointestinal bleed and remaining with pain abdomen. Flexible gastroscopy showed the tumor in all patients. CECT abdomen was done in all patients and showed well circumscribed lesions (Size, 3-6 cm) with evidence of metastasis in none. Laparoscopic sleeve resection was performed in all. At surgery two lesions were located in the posterior wall in the bosy of stomach, two were along the lesser curve(one close to gastroesophageal junction) and one had a polypoidal lesion in the anterior antral wall close to pylorus. All patients were started orally on the second postoperative day and were on normal diet at discharge. Post-operative hospital stay was 3-6 days. There were no postoperative morbidity or mortality. Histopathology revealed GIST in three, neurofibroma in one and well differentiated neuroendocrine tumor in the last. In a follow up till date one patient with GIST presented with a solitary omental recurrence one year after surgery which regressed (5 to 2.5 cm) following 2 months of treatment with Imatinib mesylate which revealed myxoid degeneration with no tumor cells. Conclusion: Minimally invasive resection is feasible and for gastric non-cancerous tumors at difficult locations in the stomach. Close followup, however is required in these patients for early detection of recurrence.